If your family is anything like mine...they like to eat. And well, it's good to eat. We need energy in the form of food in order to function properly. When we eat the right food we function even better! So, it's important with me working now that I find a way for my family to eat well while being easy and simple to prepare. Enter the slow cooker!! We use the slow cooker a LOT around here and I'm so grateful for the many recipes floating around in the web-o-sphere. I'm also grateful for the Fix-It and Forget-It 5 ingredient favorites: Comforting slow cooker recipes book that a lady from church gave me. This book has been used many many times and I plan to keep using it until we decide to stop using the slow cooker to make dinner (and with me working that won't be anytime soon). To only need 5 ingredients saves me a ton of time and money. These recipes are easy to throw together in the morning when I'm hanging out with my little ladies before I head to work. Then when we get home all we have to do is fix a simple side, of which I plan to stock the fridge with on the weekends...like rice and noodles or whatever. If you haven't started using your crock-pot as a way to save you time and money (you won't have to eat out as much) then let me encourage you to do so. It's really rather simple and doesn't take too much prep work. Case in point, I was able to prepare 8 freezer slow cooker recipes this week in the mornings while I was home with my little girls. Granted I did have the help of grandma to watch the girls but still these meals are easy to put together and could be done on a Saturday or Sunday while someone is able to watch the kids, or get them involved with the chopping and throwing things into the bags if they're old enough. 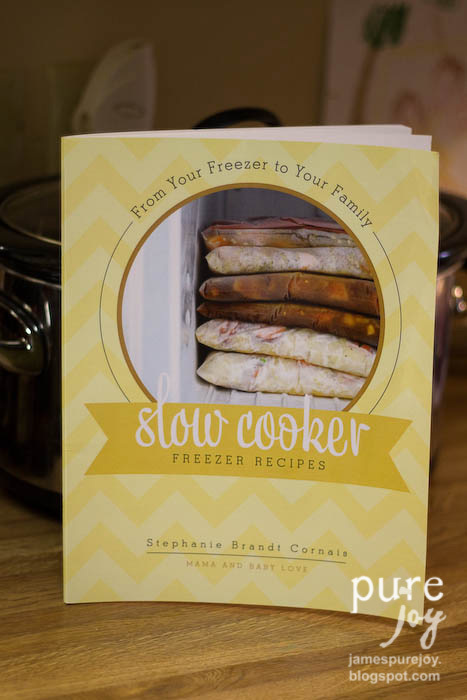 I love this freezer slow cooker cook book from Stephanie Cornais. The recipes that we've already tried were delicious and had lots of flavor. 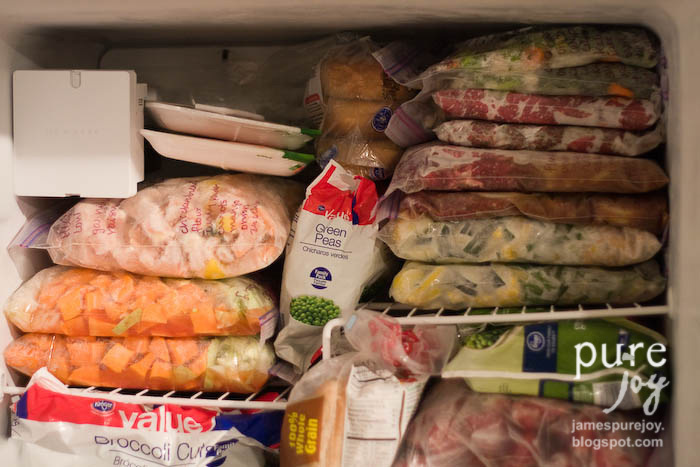 They are easy to prepare and it's SO nice to know that my freezer is stocked in case I forget to get things for one of my other slow cooker meals. It's also great to have on hand in case someone has a baby or if a family member is in the hospital, these would be easy to take for them as well. The other great thing is the Stephanie only uses whole REAL foods. No cans of cream of whatever in these recipes. I've even branched out and tried some new things because of this cookbook. I'm really excited to try to the Peanut Stew that I prepared last week!! Check out Stephanie's blog and she has a new mini eCookbook called Back to school slow cooker freezer recipes. She also has a gluten-free, grain-free dessert cookbook!! We have three freezers...a little excessive, yeah maybe. But one is a chest freezer because we get a whole hog worth of meat each year. The other came with the house and we have ours that we purchased when we bought our first house. So now my hubby has his "beer" fridge in the garage which has lots of space for me to store my slow cooker freezer meals!!! 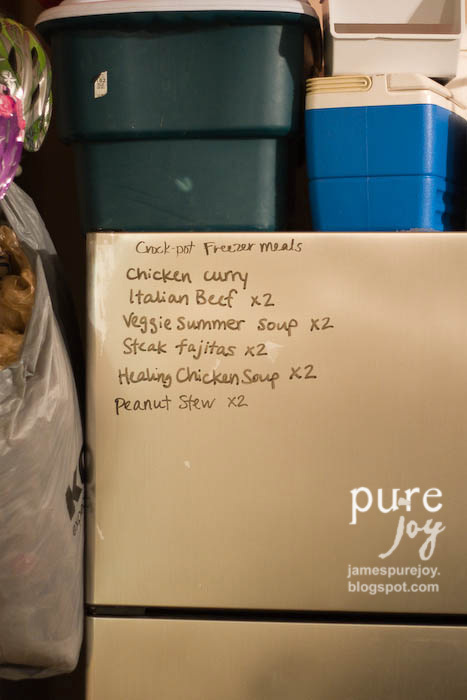 One little trick that I like to do (and feel I can do since this is just in the garage) is write what freezer meals are in the freezer with a white board erasable marker on the outside of the freezer. Then it's super easy to see what I have to put in my rotation when meal planning!! Do you have a favorite slow cooker meal? I'd love to try it. You can also see more meals that I've found and pinned here. Enjoy your back to school time and prep some slow cooker meals so you don't have to worry about dinner! !